Wiggly crochet is a fun technique that is easy to learn. Perfect for decorating, these hot pads and coasters will add a little “pizzazz” to your next holiday celebration! The complete set of 6 holidays includes Valentine’s Day, St. Patrick’s Day, Easter, July 4th, Halloween and Christmas. 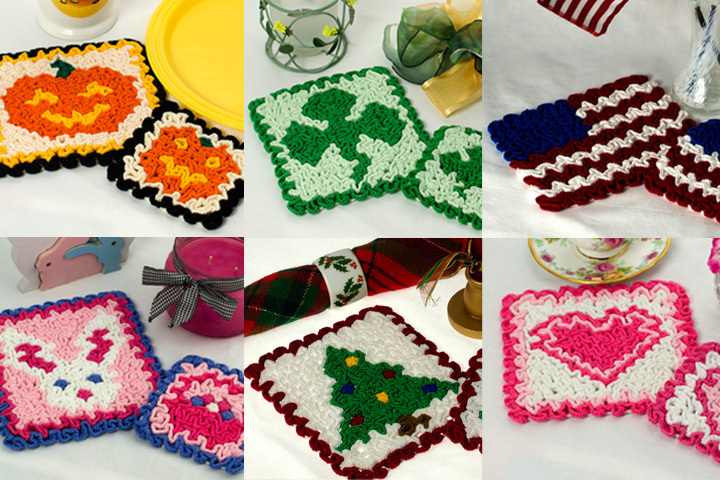 This is a special value at just under $2 for each hot pad and coaster pattern in the set. Each holiday pattern includes 2 wiggly crochet charts: one for the hot pad and one for the coaster, as well as written instructions and a brief tutorial on doing wiggly crochet.